Known Relatives: see Super-Skrull, Mr. Fantastic, and Dr. Doom; as the Invincible Man, the Super-Skrull masqueraded as father to the Invisible Girl and Human Torch, and Doom claimed to have a wife named Anya and daughter named Maria. Powers/Abilities: The original Invincible Man had all the powers of the Fantastic Four -- he could fly, generate flames, turn himself invisible, generate a force field, and possessed superhuman strength (class 5) (he could also stretch his body, but did not employ this power). The second Invincible Man could fly and generate energy blasts from his eyes. He was also equipped with technology used by the Psycho-Man, allowing him to control the emotions of fear, doubt, and hate. The third Invincible Man could fire energy blasts from his costume and generate a force field. History: (Fantastic Four I#32)- As part of their latest scheme to destroy the Fantastic Four, the Skrull Empire dispatched the Super-Skrull to impersonate Dr. Franklin Storm, father of the Human Torch and Invisible Girl. As Storm, the Super-Skrull claimed to have used a laboratory in the prison to make himself superhumanly powerful, and broke out of prison. Adopting the guise of the Invincible Man, he challenged the Fantastic Four in the streets of New York. The Fantastic Four found battling him difficult, truly beliving him to be Dr. Storm, and the Invisible Girl purposefully held her teammates back from harming him. Fortunately, Mr. Fantastic had guessed the Invincible Man's true identity, and contacted the Skrull Empire himself. When they confronted the Invincible Man at the World's Fair, he revealed to the Super-Skrull that he had guessed his identity, and the Super-Skrull was forced to return the real Dr. Storm to them. However, Dr. Storm had a bomb planted on his chest, and to save the Fantastic Four, he took the blast himself and died. (Fantastic Four I#196)- After placing Mr. Fantastic in a hypnotic trance, Dr. Doom dressed him in the costume of the Invincible Man and used him to entrap his teammates by using the equipment of the Psycho-Man to cause them to doubt themselves and hallucinate. 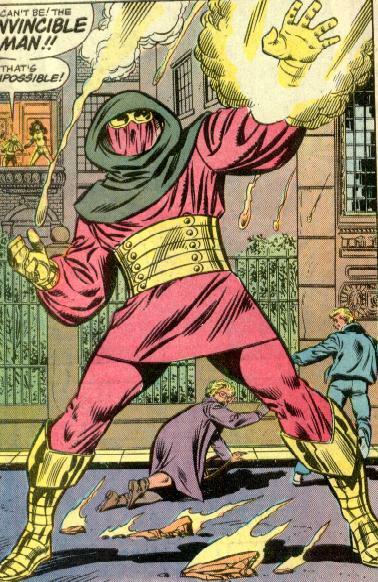 By appearing to the Thing as Alicia Masters, and to the Human Torch and Invisible Girl as Dr. Franklin Storm, the Invincible Man was able to toy with their emotions, and easily overpowered them, then turned them over to Dr. Doom, who removed Mr. Fantastic from his hypnotic trance. The four heroes were subsequently able to escape Doom's clutches. (Fantastic Four I#287 (fb))- Inhabiting the body of Norman McArthur, Dr. Doom designed a replica of the Invincible Man costume and set off to entrap the Fantastic Four. (Fantastic Four I#287)- As the Invincible Man, Doom attacked the Latverian Embassy in New York, drawing the attention of the Invisible Woman, She-Hulk, and Wasp. He claimed that Doom had attempted to steal the secret behind his armor, and that his wife and daughter were being held by Doom within the Embassy. The three heroines believed him, and stormed the Embassy, only to find one of Dr. Doom's robot replicas inside. After the Invisible Woman destroyed it, she was struck from behind by the Invincible Man, who used his familiarity from past encounters against her, confusing her. At that moment, Norman McArthur's wife Margaret struck the Invisible Woman from behind, believing that she was helping her husband. Doom then revealed his true identity to her, and took the Invisible Woman captive. Following Fantastic Four I#287, Doom took the rest of the Fantastic Four captive, and embarked upon a plot to force the Beyonder to restore his body to him, which the Beyonder ultimately granted in order to preserve the timeline. Norman McArthur was thus freed from Doom's control, and the Fantastic Four escaped his clutches. The identity of the Invincible Man has, in each case, been donned by a pre-existing character. Perhaps someday a new character can take up the suit full-time? It's probably worth noting that the Dark Raider basically wears the Invicible Man's costume.